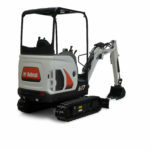 The E17 is an excellent value-for-money excavator. 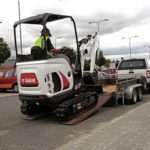 The use of thick steel tailgate and side covers, and the oversized cylinders, are just two examples of the attention paid to achieve superior durability in this excavator. 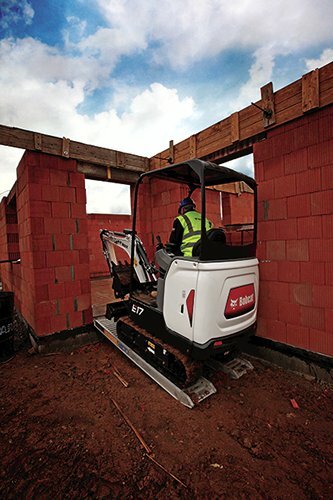 Thanks to its light weight and retractable undercarriage, the E17 is easy to transport to any job site. Plus, the unique-in-class automatic swing brake and four integrated upper-structure tie-down points make transportation exceptionally easy and safe. The E17’s unbeatable stability – combined with the superior working range – allow you to perform any job. All this, combined with visibility, operator comfort and smoothness never before seen in this class of excavators, will allow you to work for hours on end. 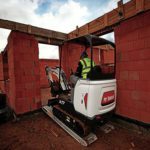 With a vast range of options – heated cabin, long dozer blade, 2nd speed, custom colour … anything you may need – the E17 is fully adaptable to your requirements. Cleaning and servicing the excavator have never been so easy. The large tailgate, openable side cover, and easy access to all components for daily maintenance reduce downtime to a minimum. 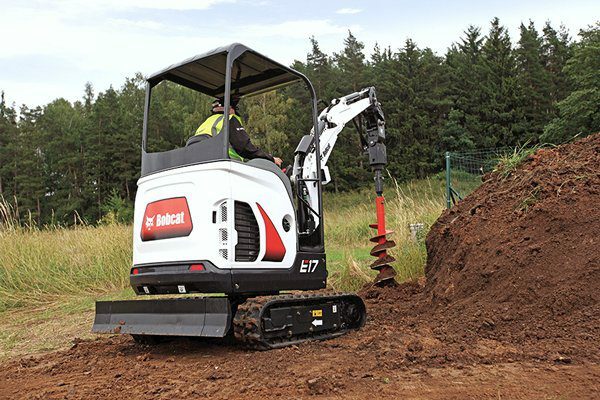 Highly durable materials make the Bobcat E17 hard-wearing and robust. The design features are tested under extreme conditions – and the heavy-gauge steel tailgate ensures extra durability and peace of mind while working. 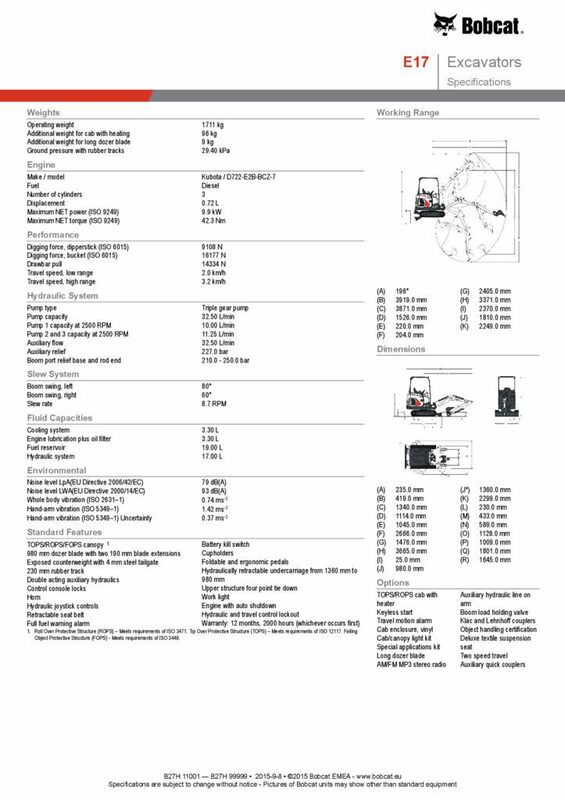 The E17 is towable on trailers that can handle up to 2,000 kg. And transportability is made even easier with the new integrated upper-structure tie-down points. The E17 cab provides an uncompromised operator environment which, together with excellent visibility, provides the best possible operator comfort and safety. This excavator is built around the operator – providing optimal ergonomics for operators of all sizes. The new cab design features large windows and narrow pillars to maximize all-around visibility. Access to the seat is convenient thanks to the wide door and the console that rises completely out of the way. In addition, when not in use, the foldable pedals increase room for the feet. Bobcat’s unique E17 hydraulic system makes the best possible use of the engine power. Fast cycle times, combined with smooth control of class-leading breakout forces, provide maximum productivity. Boom and arm cylinder cushioning – unique in their class – enhance overall smoothness. 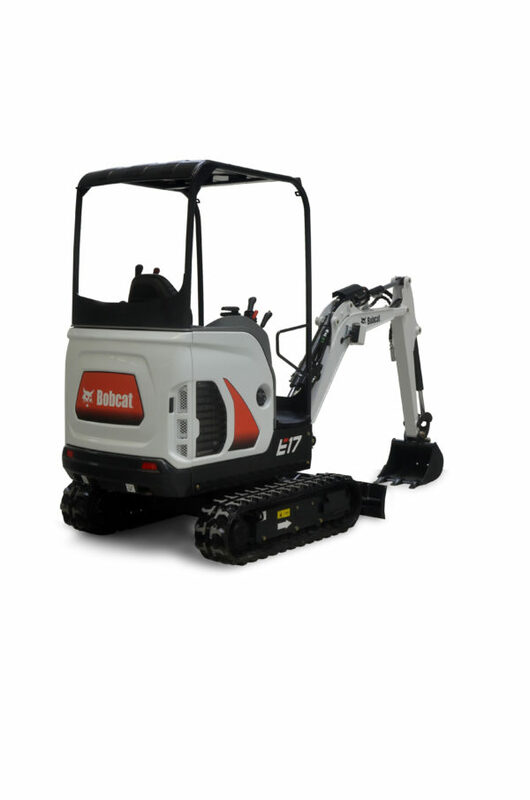 With enhanced stability and lifting capacity, combined with best-in-class proportional auxiliary flow, the E17 offers you the highest versatility in operating a wide range of attachments. 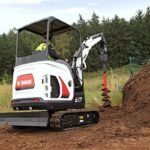 When fully retracted, the undercarriage allows the excavator to go through narrow spaces; and, when fully expanded, it provides optimum stability for the excavator, especially when working over the side. Expansion and retraction are simple and easy via an electric switch on the control panel. In addition, to help dustpan on the front, the optional long dozer blade significantly improves stability at the front of the excavator, allowing the operator to make full use of the breakout forces that the machine can deliver. Plus, new easy-to-operate durable blade extensions. Thanks to the large steel tailgate and openable side cover, all components for daily maintenance are easy to access, reducing downtime to a minimum. Daily maintenance and service points are conveniently located for easy and immediate access. Side-by-side coolers for easy cleaning. Diagnostics are effortless, thanks to the error codes displayed on the control panel and service tool connection. Floor panels are easy to remove for service purposes.